DIA DE LOS MUERTOS. Is a holiday to celebrate lost loved ones by throwing a huge fiesta with food, decorations and making altars. Dia de los muertos is celebrated November 1st through 2nd. It used to be celebrated in the lower parts of Mexico, but now it is celebrated everywhere. 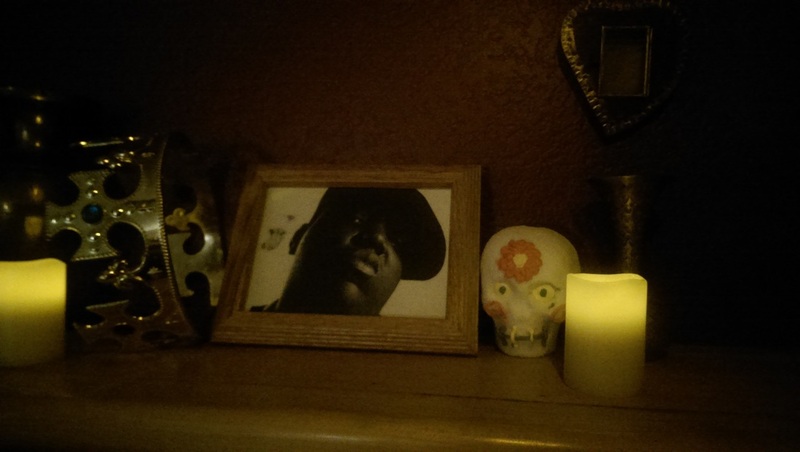 For Dia de los Muertos, I chose to honor Christopher Wallace, also known as Biggie Smalls. my altar had a picture of him with a crown and stage microphone. I covered the altar in candles and flowers to honor him and what he did. Se llamaba Christopher Wallace, y él tenía treinta y cuatro años. El cumpleanos era el siete de mayo, mil novecientos setenta dos. Él era de Brooklyn, NY y le gustaba cantar. Él era talentoso y trabajador.